They released a joint statement insisting they 'love each other' following their now infamous elevator bust up at the recent Met Gala. And Solange Knowles and brother-in-law Jay Z were busy showing they really have put their altercation behind them as they were pictured for the first time together on Saturday. The 27-year-old singer looked happy and relaxed as she joined her sister Beyonce, Jay Z and an entourage including her mother Tina and boyfriend Alan Ferguson at courtyard restaurant Cafe Amelie in New Orleans. In fact, so keen is Beyonce to dispel any rumours of a family rift, she posted several photographs of the group on her Tumblr page. One shot features the smiling singer posing with her mother Tina and sister Solange, with Jay Z beaming behind them, while another showed both sisters sitting with their children at the table. 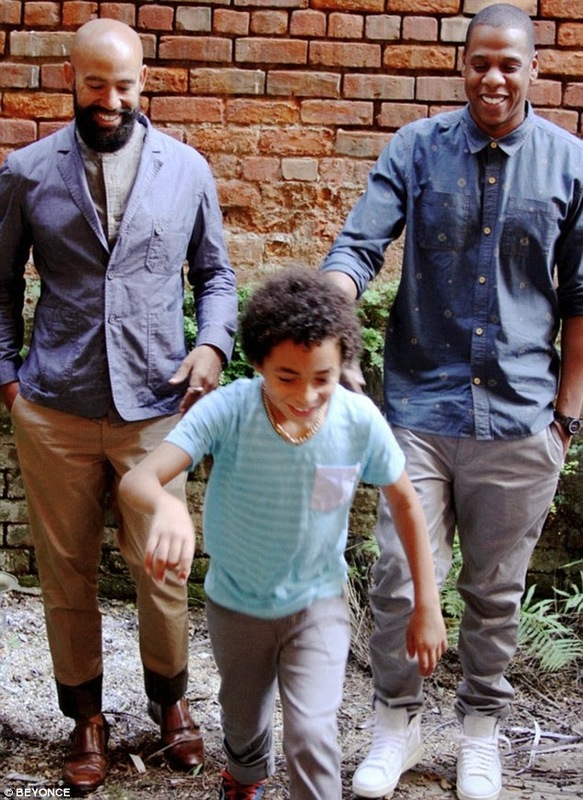 A third snap featured Jay Z and Ferguson with Solange's nine-year-old son Daniel. Dressed in a bright yellow sun dress teamed with leopard print rimmed Sunglasses, Solange smiled as she walked next to Jay Z before leading the party out of the restaurant. The rapper also looked in cheerful mood, smiling broadly as he chatted to Beyonce's mother Tina while his wife carried their two-year-old daughter Blue Ivy. The growing youngster wore a pretty green and white floral outfit which coordinated perfectly with her mother's striped sun dress. Beyonce and Jay Z arrived in the Louisiana city last week and were seen on Friday enjoying lunch with Blue Ivy and shopping at a children's boutique. The family seemed keen to put on a united front following the altercation at the New York Met Gala, which was captured on the Internet and leaked via hotel surveillance video. Footage showed Solange lashing out wildly at her 44-year-old brother-in-law, with both her arms and her legs, while Beyonce stood beside them looking curiously impassive. The following day, the two sisters and Jay Z addressed the video captured by cameras at The Standard Hotel in New York. 'As a result of the public release of the elevator security footage from Monday, May 5th, there has been a great deal of speculation about what triggered the unfortunate incident. But the most important thing is that our family has worked through it,' they said in a statement. 'The reports of Solange being intoxicated or displaying erratic behaviour throughout that evening are simply false,' the statement continued. 'At the end of the day families have problems and we're no different. We love each other and above all we are family. We've put this behind us and hope everyone else will do the same. 'It is unclear what exactly caused the altercation between the rapper and his sister in law. But according to the New York Daily News, the blazing row was actually sparked by Jay Z, who snapped at Solange when two of her friends tried to get into the after-party at The Standard hotel in Manhattan by saying they were friends of the rapper. And it was when Solange demanded that she, her superstar sibling and Jay Z leave the party that the rapper said he was heading off to Rihanna's bash without Beyoncé, prompting Solange to hit out at him. Jay Z soon got wind of it and snapped at Solange, saying 'don't use my name'. This in turn prompted Solange to insist that she wanted to leave the bash. On the way out, Jay Z said he'd be heading to Up & Down on West 14th Street, where Rihanna was holding her own post-Met Ball bash, a second source said. Allegedly, the star said he didn't need extra security because Beyoncé was not joining him. The source said Solange, who seemed 'drunk and irritated', said: ‘Why can't you go home?' telling Beyonce 'Why does your husband need to go to the club right now?'" But Jay Z replied: 'You're one to talk', which apparently sent Solange into a rage. Once inside the elevator, she started punching and kicking her brother-in-law - an attack that was caught on surveillance video and leaked to TMZ.com on Monday. Two days after the video leaked, Beyoncé showed her public support to her sister by taking to her Instagram account on Wednesday to post tender images of the two together following their lunch. It was the Drunk In Love crooner's first acknowledgement of the incident despite her leaving the captions for the five photos blank. In the heartwarming image, the Single Ladies singer and her sister have their arms wrapped around one another as they smile and pose for a picture.